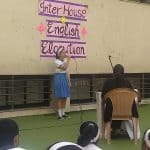 The Inter-House English Elocution Competition was held on 23rd January 2019. The topic for the Declamation was ‘Women Empowerment’. Students of Std.8 & 9 participated in the event. The students showcased their oratory skills in a refined manner. The judges applauded the efforts made by the participants. 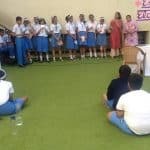 Mrs. Neeta Tandon (Subject Head) addressed the students and encouraged them to participate in such competitions. The program concluded with the vote of thanks.